The Gunk Haus test kitchen was sizzling today, actually it was baking: Chocolate-filled pretzels, stuffed pretzels, and turkey stuffed strudel, and after all that I was stuffed as well. It was a busy work day. 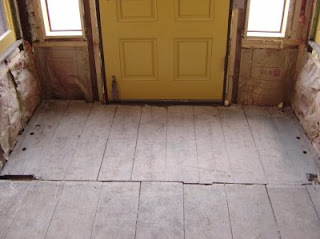 I finally tackled the last big floor repair project in the bar: The entrance floor. 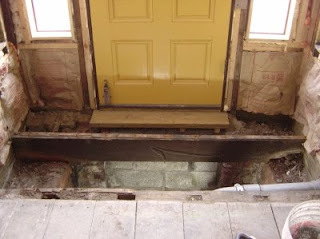 It isn't actually the floor that needed repair, but the underbelly. 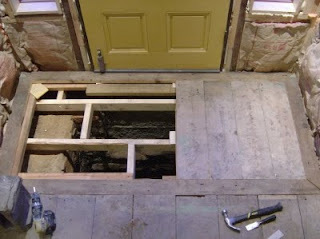 The floor boards were largely supported by one beam in the center, and completely unsupported on the door side. The main entrance, like so many things around Gunk Haus, is not original. 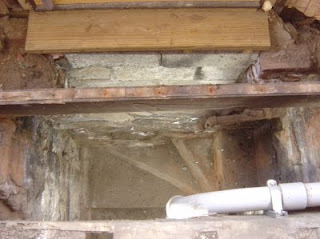 In the beginning there was an outside access to the basement, and the stone stairs are still underneath the main entrance. 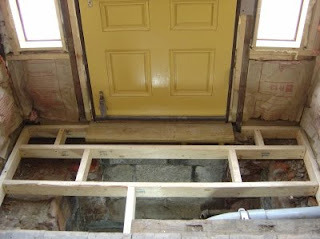 I have the tendency to over-engineer, and the framing for the entrance floor is not different. Slap the floor boards on and it looks fantastic. Does anyone else reading this blog think that D and E both deserve to wear capes and a big S on their chests?